This post is a bit more about pure content curation than what’s come out so far on BigSkyRise. For the next couple of weeks I’m working on some big things for BigSkyRise. These are aimed at taking things up another level and at providing more actionable content for you. BigSkyRise is about sharing things that help with living a happier, more fulfilling life, even if those things don’t come directly from here or from me. So, along with sharing content created specifically for this site, I want to highlight helpful information that is already out there and that is worth reading. Sharing that type of thing has been in the plan all along, and now is a good time to actually implement it. So, for today’s post, I gathered three solid and on-topic articles worth spending some time on. Thus far, much of the attention around being mindful here on BigSkyRise has been about being in the now. For most of us, we frequently spend our time swept away by thoughts and emotions of what has already happened, what might have been, or what may be in the future. Counteracting that tendency is very important to living more mindfully and to being more connected with life, particularly when starting out on our mindful journey. There is actually quite a bit more to mindfulness than just that, and once you’ve gotten a taste of mindfulness and being in the now, it is worth exploring. This piece on mindfulness and the power of awareness provides an easy entrance point into the topic of mindfulness and touches on some of the other aspects that come from training to be mindful; ones that surface more as we progress in our training. In addition to absorbing some of the useful insights into mindfulness, try out some of the short exercises that are included. Are you limited by fear? 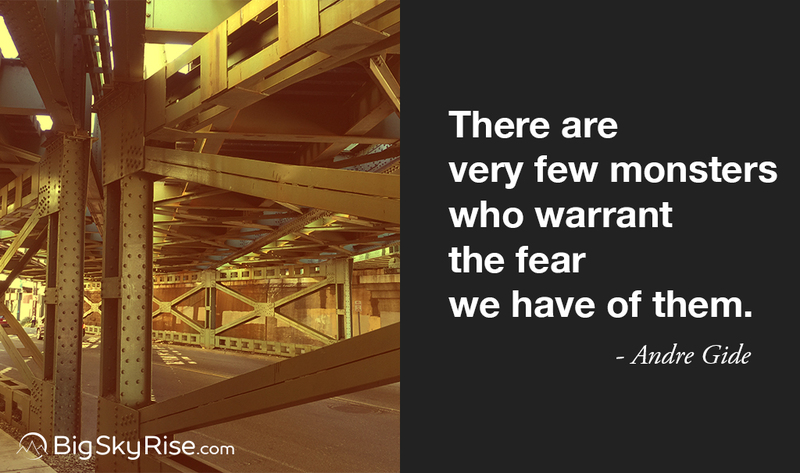 Fear is a big topic and a pervasive issue in our world and in our minds. It can be both a motivating and demotivating force. Unfortunately, for most people, most of the time, it tends to be something that limits us from reaching the heights we are meant to. This short piece, written by Leah Cox, tells of the author’s own experience regarding the limits that fear placed on her, and what she discovered by actively taking on her fears. Given fear’s impact on our lives, it is a worthwhile read. Additionally, fear is a topic that is touched on in upcoming posts here on BigSkyRise and that will be explored more thoroughly after that, so reading some about it now will be beneficial. Much like the emotion of fear mentioned above, negative and difficult thoughts are something we all face and share. Learning how to deal with them, and to keep them from controlling us is one of the benefits of practicing mindfulness. Andy Puddicombe shares some very useful insights and perspective in this question-answer post on negative thoughts. BigSkyRise is about sharing useful information, whether it comes from me, or from someone else, somewhere else. In that light, and because I’m working on some big things for BigSkyRise, this week, I’m sharing three articles from other sites that are worth reading. Like these articles and what you see on BigSkyRise? Spread the word to your networks.